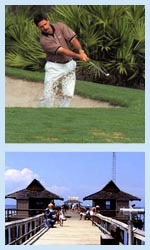 Golf is an important part of Naples and its History. There's a story that goes something like this… Shortly after the Naples Beach Hotel Course was built, a small single engine airplane would often land on one of the fairways. The pilot would disembark and play a round(9 holes then), climb in his plane and depart. This was fine until a new Course Superintendent came on board. When he saw this, he immediately chased the flyer away(off HIS fairways). Mr. Lindbergh never landed on the course again!!! Golfers have been coming ever since by boat, car, train, and once again by air. A large number of our developments are Golf Course Communities. Some excellent designers have 'carved' a place in the sun. They include; Jack Nicklaus, Gary Player, Arnold Palmer, Arthur Hills, Tom Fazio, Robert Trent Jones, Sr., Joe Lee, and many, many more. In fact, we have more courses per capita than any area in the world. When you stop for lunch or go out to dinner, odds are you will be in close proximity to a golfer's table. Listen carefully, it might be tomorrow's match…. With so many wonderful and challenging courses in the area, its a new experience everyday!! Whether you enjoy the challenge of bunker play, navigating water hazards, the company of local wildlife, fast or undulating greens, or just a friendly wide open course; you can find them all in Naples. Showoff your long drives on Lely Flamingo, playing 7171 yards from the Championship Tees. Challenge the wind at the Naples Beach Hotel and Golf Club, or demonstrate your finesse around the green at Pelican's Nest. If you like golf, you will love Naples. Naples sets the standard for golf in South Florida.